Wear a Hat for Keith! This year we have our own story to add. Pictured here is Keith and his wife Sandra. Keith is 63 and sings Bass in our Exeter choir, Sandra sings Alto. They have been members of the La La family for several years. In January Keith and Sandra went away on a cruise to celebrate Sandra’s upcoming birthday. They had an amazing time. 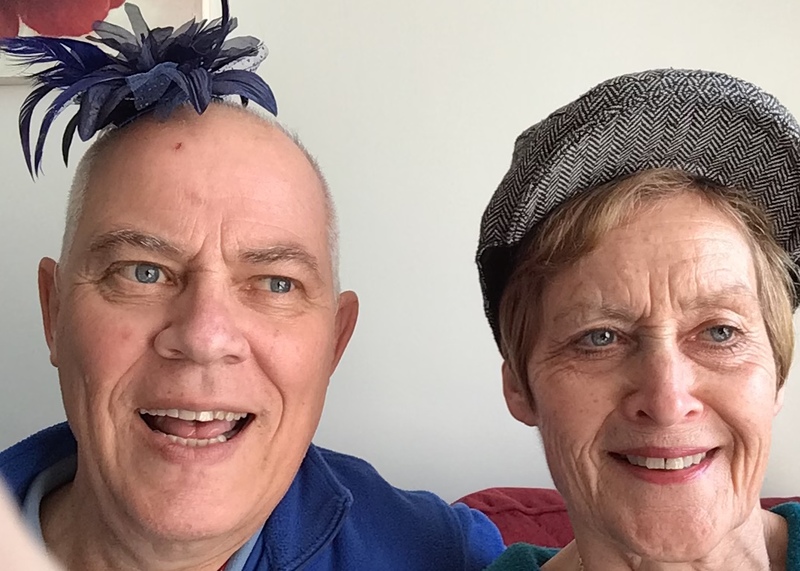 But only three weeks after their return Keith had lost the use of his arm and was quickly diagnosed with a Grade 4 highly aggressive Glioblastoma. It is incurable and inoperable. He has started treatment and is now enduring twelve weeks of radio and chemo therapy which the Doctors hope will improve their prognosis of 6 to 12 months life expectancy. So please help us to do what Keith would love. Turn this horrible story into something good. Use the reality to achieve things for those that will come to this same point. If you would like to donate to any of the charities we are supporting this week, you can do so through any of these links. And don’t be glum. Put your hat, or wig, or scarf or even pants on your head and wear a smile for all the good that comes out of this.